Picturesque is the ideal program to add a finishing touch to your pictures, polishing them off before sharing with others. The application showcases your selected images from the strip on the top of the interface. Just click on one to bring it up and start editing. Picturesque offers five specific effects: perspective, reflection, shadow, curve, and stroke. I was very impressed by the 3D effect given in perspective and the reflection. The way effects are added onto your pictures is also really impressive. 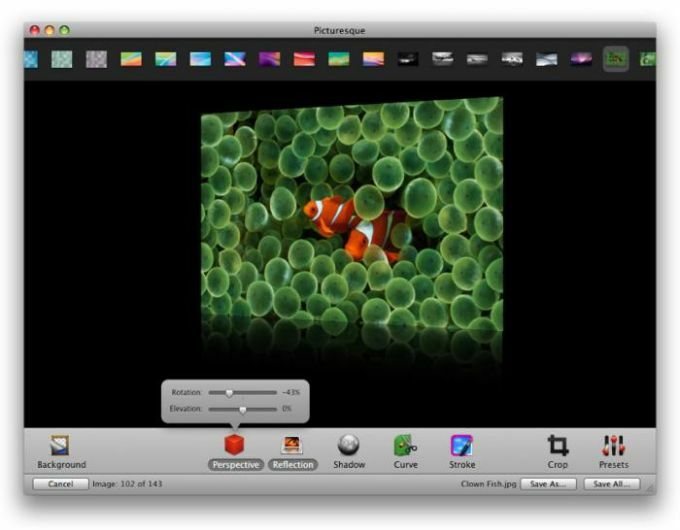 All changes made to an image are saved as presets, which you can view in the list on the right of the interface. This is very handy for batch editing images. Just select the ones you want to change when your preset is set. You can add as many presets as you want. Although Picturesque lacks any proper image editing tools, it offers a great set of snazzy effects to turn your pictures into masterpieces. Fixes an issue with batch saving JPEGs. With an animated "drag and drop" style interface, Picturesque can beautify your images with reflections, soft glows, shadows, delicate curves, strokes and fades in less time than it takes to open Photoshop. Picturesque can also beautify a whole folder of images in batch with a single click, and includes Automator actions for automation. Simple, refined and elegant interface. 6 tasteful effects that look great. Beautify multiple images in batch. Built-in image scaling, so you can batch create gorgeous thumbnails. Save with transparency, so your images look great on any background. A set of Automator actions to add beautification to your workflow. Re: Pricing. Picturesque varies in price according to the license you require. Full details can be found here: http://www.acqualia.com/store/picturesque. Tell me the price. My opinion I will withhold until I find out how much this app costs me. You devote a page to a whole bunch of marketing blather but coyly don't tell me what it's gonna cost. What do you think about Picturesque? Do you recommend it? Why?